Below are the official Hockomock League Girls Swimming All Stars, selected by the coaches in the league. MILFORD, Mass. 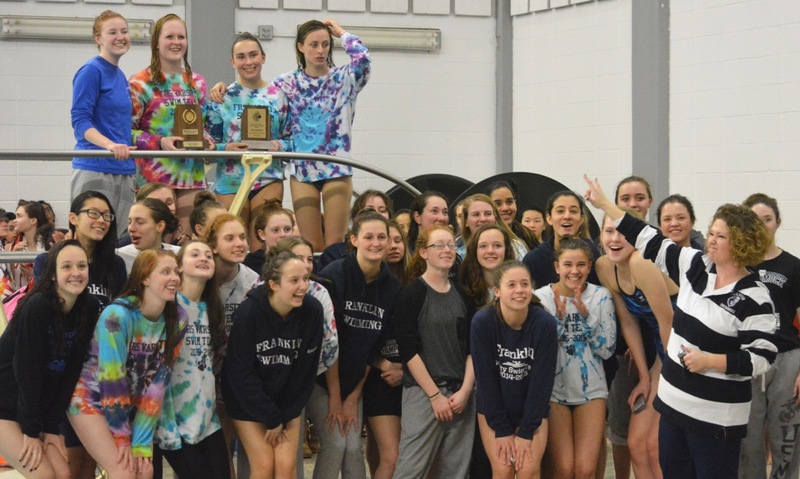 – After back-to-back seasons of finishing in second place to its league rivals, the Franklin girls’ swimming program brought home its first Hockomock Championship title with a dominating performance on Saturday at the Milford High pool. The Panthers finished with an overall team total of 383, more than 100 points better than defending champion King Philip’s total of 264. The top five was rounded out by Taunton (230), Sharon (186) and North Attleboro (186). The championship meet was the culmination of a season of first for the Panthers, who also finished undefeated in the dual meet season and won the Kelley-Rex title for the first time in the seven-year history of the program. It was not that long ago that the Panthers finished a season winless, but a strong crop of swimmers entered the relatively new program and helped raise it to the championship level. Those swimmers are now seniors and capped their final year with Franklin swim with the title. The Panthers jumped out to a quick start and took control of the meet. After four events, Franklin was ahead by nearly 40 points on second place Taunton. That jumped to a 195-109 lead after the fifth event and the meet turned into a race for second place. Ashley Loomis was a standout for the Panthers on Saturday. She claimed the 200-yard freestyle title in a time of 1:58.58, which was 13 seconds better than Jennie King of Taunton in second. Loomis added a similarly dominant performance in the 500-yard freestyle, winning with a time of 5:15.49, which was nearly 20 seconds better than Sam Nason of King Philip. Loomis also was part of the 200- and 400-yard freestyle relay teams that each took first for Franklin. “We were confident, but we didn’t let that stop us from racing hard and I think that showed in how much we succeeded,” said Zogby about the team embracing the favorite tag that came from winning the dual meet season. Depth was a key to the Panthers success in winning the meet title. Franklin had one of the larger teams in the meet and, as Pridham explained, it was not just Zogby or Loomis bringing in first place points, but the ability to score points up and down the roster that helped the Panthers win so decisively. In addition to Franklin swimmers, several others had notable performances in the pool on Saturday. Emma Bridges of Foxboro won both the 100-yard butterfly and 100-yard breaststroke. Tiffany Ha of Canton won the 100-yard freestyle, narrowly beating out Callie Sullivan of King Philip, and finished second in the 100-yard backstroke. Tara Zhou of Sharon won the 50-yard freestyle, the 100-yard backstroke, was part of the Eagles’ winning 200-yard medley relay team that took first and the 400-yard freestyle team that claimed second place.